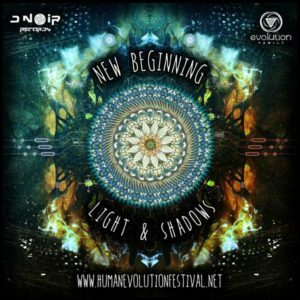 Evolution Family, in collaboration with D Noir, is glad to reveal New Beginning (Light & Shadows), a double compilation expressing all the colors and sounds that you’ll find at the Human Evolution festival. Having reached the sixth edition in its history, building up year after year, their specific approach to organize the timetable can be heard here. The playlist contains 22 finely selected tunes showcasing two sections, capturing the broad genres of daytime and night trance, expressed in the journey from light to shadows. The numerology of 11:11 stands to symbolize the revelation and the strength to spread the message of absolute knowledge arriving at the gate of a superior form of living. The sense of awareness that gives the man a drive to strive forward, a hope that resides within each one of us. Mastered in Berlin by Biomekanik. Artwork by Djane Sati. MP3 Download | FLAC Download | WAV Download · Download count: 21,574. Nice in all dancefloors thank you ! very great tracks! thanks a lot! fkin love killawatt’s killer track ! Many really good tracks on this release, thank you !